When Curtis was gone last March, there were several places that I visited with my family that I just knew I had to return to with him. The one I thought he’d enjoy the most was Koko Crater Botanical Garden. On a cloudy day off when we couldn’t even see the mountains, we decided to head to the Southeast corner of the island to enjoy the loop hike around the gardens. 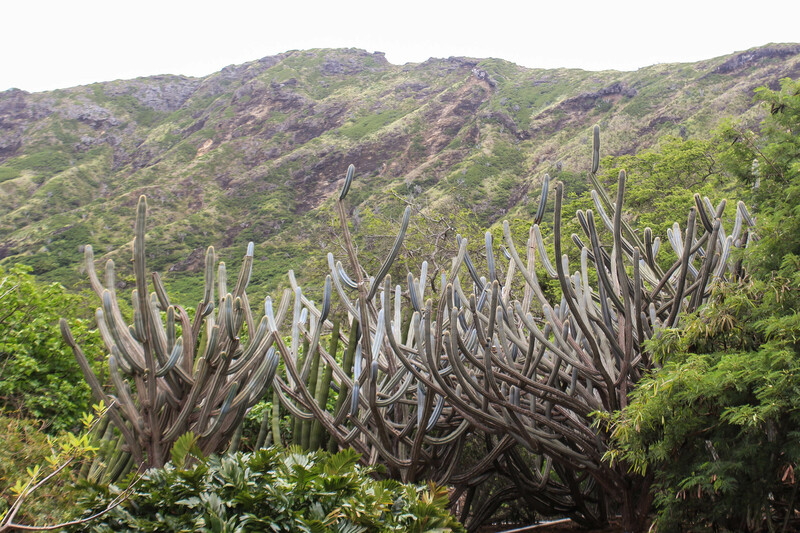 In comparison to Ho’omahulia Botanical Gardens, Koko Crater is dry, colored with warmer tones as opposed to the cool, lush green tropical feel. Koko Crater also requires exploring the gardens entirely by foot rather than being able to drive through the park. The entire thing is outside, so it’s exposed to the elements. There is no fee to enter the park. There is a 2 mile loop trail that circles around through the crater, with several side trails branching in other directions, all making their way back to the loop. The plants growing mostly originate either from North America (specifically the Southwest US) or Africa. There are pamphlets offered at the beginning of the trail to help guide you through, and many of the plants and trees have small plaques nearby with their name and place of origin. The reason I knew Curtis would enjoy this place as much as I did was because of the Southwestern themed corner in the gardens. Sometimes we see different varieties of cactus along the trails at lower elevations, but here in the gardens there are more we haven’t seen anywhere else, including barrel cactus and even saguaros! It’s like our little pocket of Arizona desert hidden on the island. The first time I rounded a corner and saw the first saguaro, I was so happy I could have hugged it. 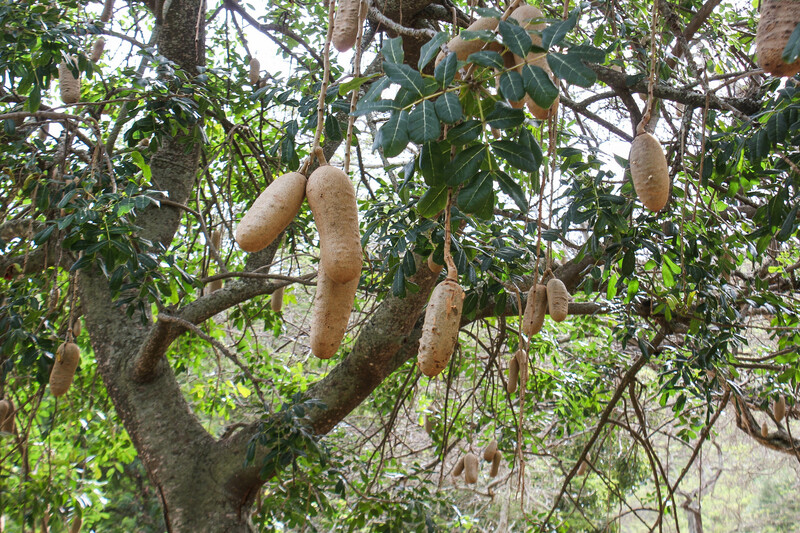 Other highlights throughout the park include very unique and interestingly shaped African trees, the sausage tree with “sausage fruit” that is inedible but looks like potatoes, and a large plumeria grove. Unfortunately plumerias weren’t in season when I visited with my family in March, so the whole grove was mostly brown, bare trees with a few flowers starting to bloom. It looked very different when we visited in mid-May! 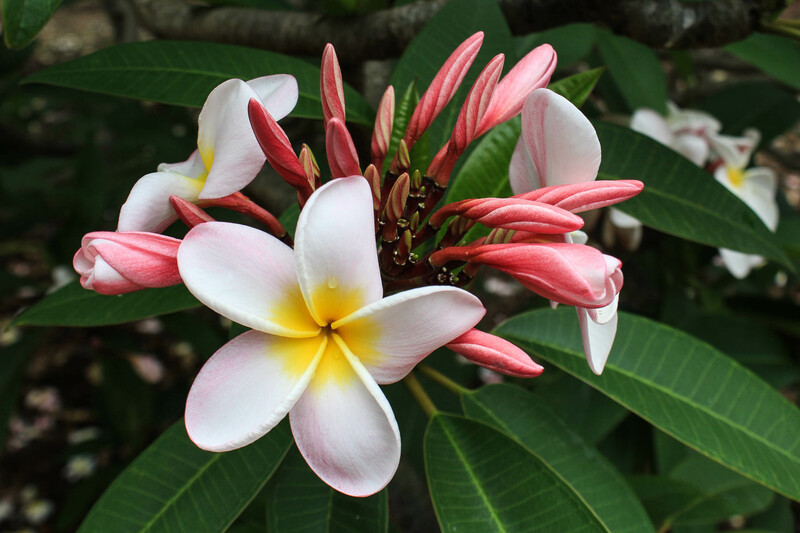 Plumerias thrive the most in the summer months, with the earliest flowers blooming in March and lasting until the fall. 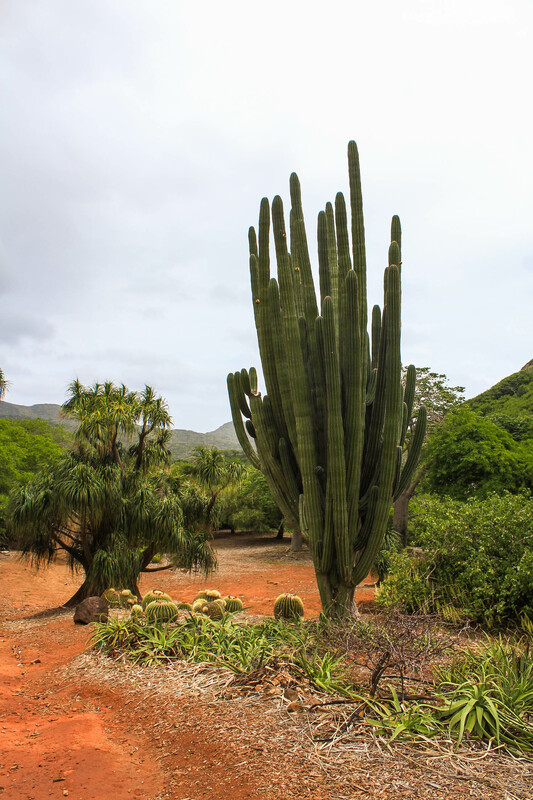 Another thing to love about Koko Crater Botanical Garden is that even when I’ve gone on weekends, they’ve never been busy. (I suppose I haven’t been there at peak plumeria season though so I can’t speak to that!) I’m not sure I’d recommend the gardens for visitors. They aren’t incredibly scenic, besides the unique plants and a few views of the crater rim high above. The trails aren’t very well marked and there are long stretches where there isn’t much to see. That being said, being a resident on the island I find it very relaxing to get away from crowded places and enjoy and easy and safe hike, and I liked it enough to bring my family twice! I’m sure I’ll make many more return trips, if only to visit “my cactus.” 🙂 If you’re interested in learning more about the trail or gardens, check out our AllTrails recording or the official park website.